I was looking for some fennel because I like a little of it chopped up in a salad to add both a bit of crunch and an interesting aniseed-y flavour to the usual lettuce, cucumber tomato combination. But Morrisons in Dumbarton clearly wasn’t the right place to be looking. The west of Scotland is renowned for its distant acquaintance with fresh vegetables in general, although it is much more broad minded in this regard than when I was a child, so it is rare to wander around the fresh produce section in a supermarket and be assailed by that feeling of green and abundant plenty that can be so overwhelming in the South of England. You’d have been well supplied if you were looking for potatoes, pre-mashed turnip, or tomatoes and bananas, but there’s not the 15 varieties of lettuce, or ten types of green beans that tend to confuse me in London. Instead I was left scanning every shelf for things I might add to my salad to spice it up. 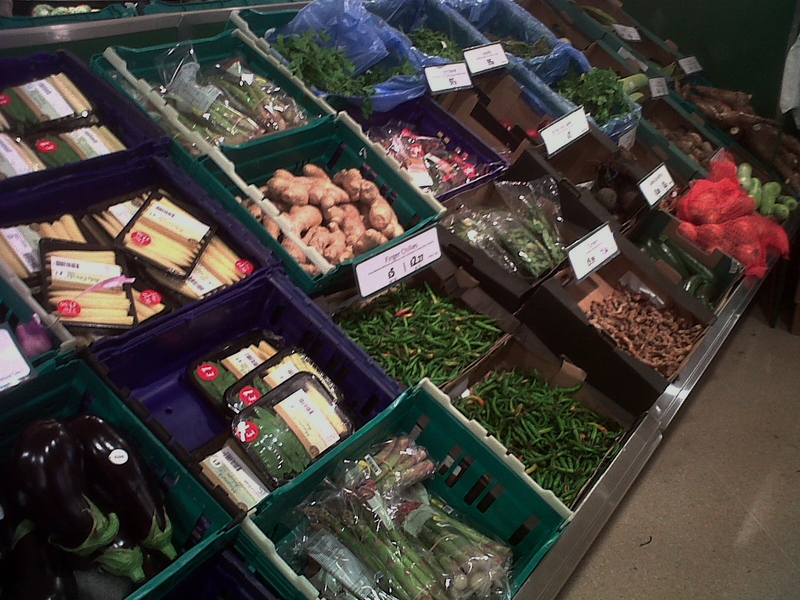 The most fascinating section was the rack of what might best be described as the ‘exotic’ produce. Along with cassava, baby chillis, root ginger, coriander, lychees and plantain, and a few rooty looking things that I recognise but don’t know the names of, there were also baby corn, mangetouts, aubergine and English asparagus. ‘Exotic’ clearly depends on what you’re used to. Pre-mashed turnip? I don’t know why that is so funny, but it really is. It looked like mush in a plastic packet. I presume you just had to heat it up for the perfect accompaniment for something stodgy! It didn’t look very nice, but I guess it’s the very latest in convenience for the cooking averse!